The job market is competitive to say the least. Sure, there are jobs in other fields available, but once you have climbed a tower… how could you ever go back? When a good job in the tower climbing industry becomes available, many, many candidates will apply. When an employer gets a stack of resumes, yours needs to be at the top of the stack. When your resume is listed on TowerClimber.com, you will have our tools to help you make the most out of your job search. Unlike other job sites, TowerClimber.com is JUST for tower climbers, meaning that every employer who sees your resume is looking for your skill set. There will be no “hey we thought you might be interested in this unrelated job opening” emails. Just the jobs you are looking for will reach your email, this will save you time and frustration. When you post your resume, employers will be able to see it from their laptop, desktop, tablet, and phone. It is convenient for employers, which is ultimately good for the applicant, that’s you. But we didn’t forget about all of the benefits for job seekers. Statistically, the sooner you get your resume to an employer, the better your odds of getting hired. Even though an employer may technically be interviewing for three weeks, but by that second week, they have a good idea who they want to hire. With job notification alerts from TowerClimber.com, you will know the moment a job opens up, so you can have your application on the top of the stack. Because life changes we keep your resume in our database even after you have found that perfect job. If you end up not liking the company you work for or need to move, your resume is already up, ready for your updates. While you are happy and content in your job, you can choose to keep your resume searchable to employers or not. You can also shut off new job notifications, so you can eliminate those extra emails when you no longer need them. Working with TowerClimber.com is like having your own personal recruiter working for you 24/7/365. This means that more time can be spent polishing your interview skills, catching up on laundry, and all of the other things we do during life’s moments of downtime. At TowerClimber.com, we strive to think differently and to do things differently. We want to make the job searching experiences a great one, for both employers and candidates. These are just some of the updates and innovations we have already made to our site. And there are more on the way. 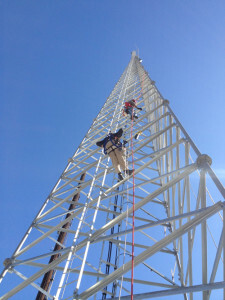 We strive to make our site the most comprehensive and complete tower technician website in the world. If you haven’t already, register as a candidate and post your resume here.